It is time for there to be less diapers in the Kicks’ home. 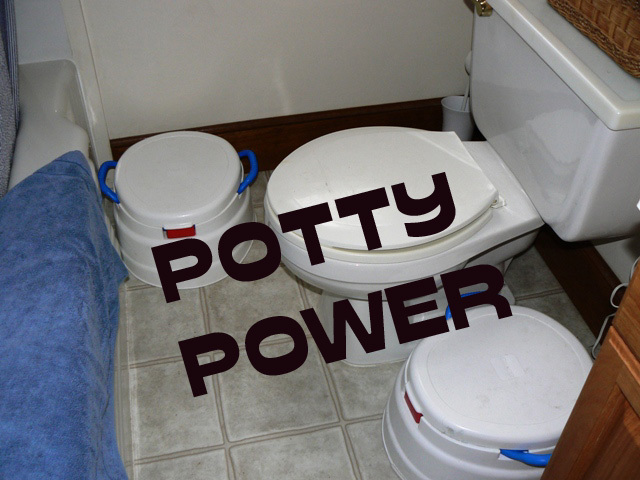 My mom gave us a video called “Potty Power” – it literally scared Bubba when we first watched it. He stood BEHIND Little to watch – not the first time but the second time – when he knew what was coming. The video starts with a game – they call it baby or big kid. I call it the Shame Game. They say something and you tell them who does it – a baby or a big kid. Things like, “Who sleeps in a crib?” “Who eats with a fork all by themself?” “Who wears a diaper?” “Who goes poopy in the potty?” While they are saying “baby – big kid – baby – big kid” I really believe my son is hearing, “Bubba is a baby- Bubba is not a big kid- Bubby is a baby- Bubba is not a big kid” hence the hiding the next time he saw it. He must have gotten over it though because he walks around the house (and Walmart) singing, “We wipe our bottom front to back” and “I can do it myself I’ve got Potty Power.” So, it was no wonder the song was in my head today when we returned from . . . Walmart. I was sitting at the lunch table singing and washing hands to get down and said, “Let’s all go sit on the potty.” Little got so excited and ran to the bathroom. Bubba joined her and everybody plopped on a potty. Bubba, whose diaper from this morning was completely dry, began to potty. I screamed and yelled. He got excited, wanted to see what he was doing and leaned back – meaning (yes, you got it) I got pee all over me. Still, I screamed and clapped and yelled. He yelled, “Potty Power!”. I turned to Little and said, “Your turn.” Her response? “Okay” and screaming and clapping ensued. This is where my mom says, “Did you give them an M&M?” I didn’t – they got sweettarts and we called family to tell them the news. My life is hilarious! PLEASE pray that they will catch on to the potty – it would be such a blessing. Specifically pray that Little would be able to learn awareness of her body so she would know she needs to go. Girl, potty training two at one time? I will certainly pray for you! Thomas was pretty impressive for the first time! Keep those sweet tarts coming. I’ll pray for Little and the potty training process, too. I think we got this video at the library. Doesn’t it have a monkey in it that wears a diaper? I mean if that doesn’t help a kid learn to use the bathroom what will? I love it. Maybe I need to get that video for Sam. We too used Potty Power. I too sang those songs in my head and thought “I’m going crazy”. And Emma Caroline got scared but it was of the weird joker in the play. It didn’t work for us, only served to make mommy crazy. Sounds like you have had success which makes it worth every annoying song on it!! !